Me, happiness tips, and a joke. My paternal great-grandfather and great-grandmother left Ireland as children. I imagine their parents were young, poor and full of hope in the life they would live in America. They brought their hard work, faith, and love with them. My great-grandparents lived a long life and I was privileged to know them as a child. And I was raised in Scranton, Pennsylvania, where being an Irish American is a point of pride. I’m talking seriously proud enough to throw one of the largest and oldest St. Patrick’s Day Parade in the country. The day…week… is over the top green, beer-drenched, hilariously funny, and full of delicious corned beef and cabbage. Those not familiar may be inclined to see only the silly and superficial (I can’t explain green beer, for example.) Those in the know understand that a good joke, a rousing sing-a-long, and a cold brew with friends have carried many a people through hard and dark times. Every year for St. Patrick’s Day, I’m glad to set aside the challenges of life to remember where I came from. I’m grateful for generations of my relatives before me who sacrificed to benefit me and my children. We remain connected in a mysterious yet tangible way. I’m proud of my heritage and if that means wearing green, going to a parade, throwing a party, singing Clancy Lowered the Boom, and making Irish soda bread, then that’s exactly what our family will do. Dear St. Patrick, and all who hand down faith, hope, and love, a mighty cheers to you! Do you celebrate St. Paddy’s Day? What is your favorite way to celebrate your heritage? This entry was posted in Family, Food, Happiness, Lifestyle, Popular Culture, Relationships, Solo and tagged Articles, Celebrate, Music, St. Patrick's Day. Bookmark the permalink. 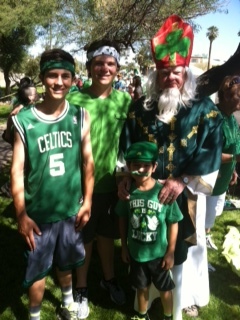 St. Patrick’s Day meant only wearing green to me before I met P.J. P.J .is from New Jersey and from a very Irish family. In the 10 years that we have been married I have learned much about St. Patrick’s Day. A few years ago I taught an entire lesson on the origin of St. Patrick’s Day, I often cook corned beef and cabbage throughout the year, we make Irish potatoes, and a rotten little leprechaun visits our house each year only to make a mess of the kids room! Those are a few of our traditions and I hope that my children continue them as they have a family of their own. I actually went to school today myself with green pants, and fingernails! Happy St. Patrick’s Day! May your day be filled with Irish luck! Fun! Thanks for sharing your lovely traditions with me, Kesha 🙂 The luck of the Irish has been with me all day! The blarney has been with me all day too! Happy and blessed St. Patrick’s Day to you and yours, Angie. 🙂 Slainte! How fun for you and your family! There’s always a reason to celebrate. “There’s always a reason to celebrate”…exactly! I don’t really have many traditions, but I do insist on putting something up on the walls and wearing something green with a wee bit of orange. (I am Protestant after all, 😉 ) I love window clings too, and I have a bunch of shamrock window clings that I also add to all the mirrors in the house. Oh, I mustn’t forget Shamrock Shakes. I do take 4 “indulgence days” on my diet every year, and one of those is for my Shamrock Shake. My body hates me for a few days afterward, but it’s so worth it, lol. I am sure you had a great day! My favourite holiday is Greek Easter, a lot of church and a lot of traditions! Actually everything starts with the Lent. We have every Friday evening a special service only for Mother Mary, and then from Palm Sunday , we start additional services every night, culminating on Good Thursday and Good Friday where it goes from 7pm till midnight almost. The resurrection takes place on Midnight from Saturday to Sunday Easter. A must are new shoes, we also make presents to the kids except the chocolate eggs , shoes must be, either white or red! If you wNt to experience something special , then you have to be in Greece at Easter time. It is the most important holiday of the year. You are right , but you know how it is ; the big challenge is to swim against the tide ! How to happily return to blogging and other social media after a break, for real. How to be likable and improve quality of relationships, on and off the road. No bunting, only hit dingers, and a few funny thoughts on when life produces a home run or two. Why my daughter loved Gilbert Blythe and now we're both misty-eyed.